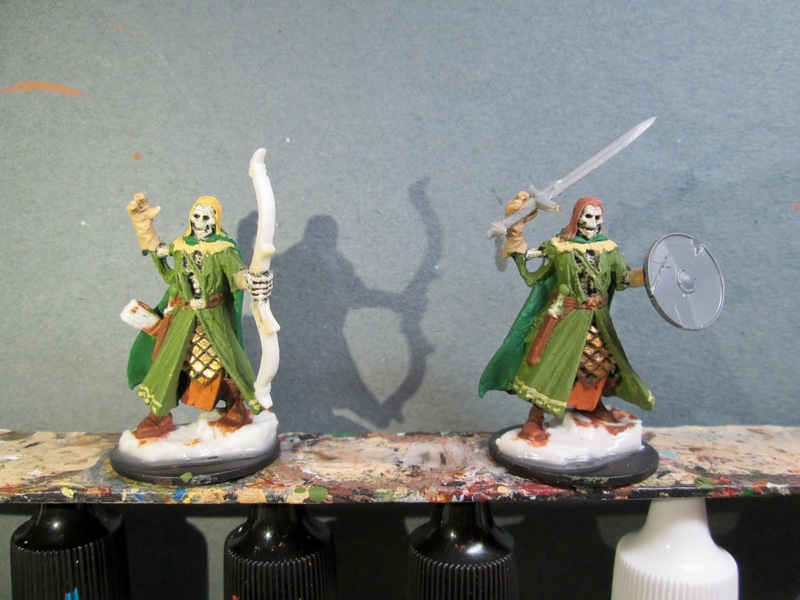 Undead Elf Archer & Conversion: Bones 3 Figure | H.A.W.K.S. 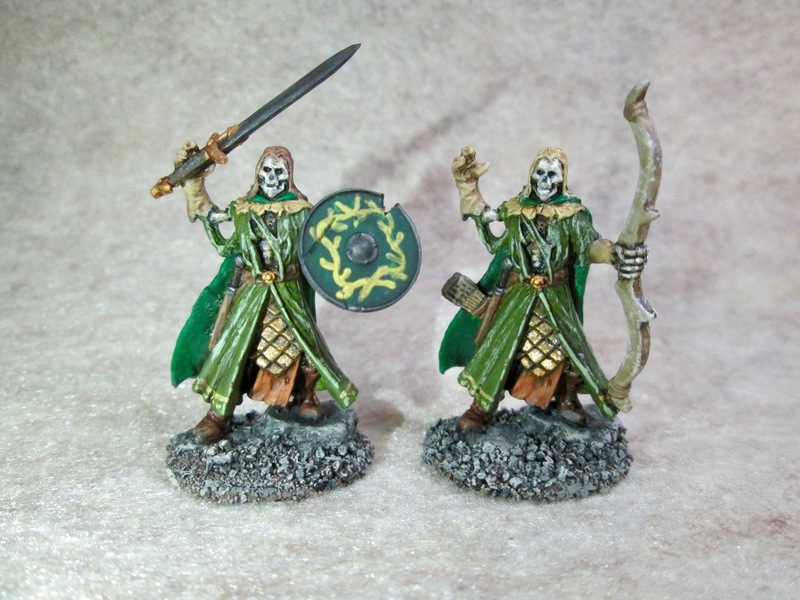 This past week I painted a pair of the Undead Elf Archers from the Bones 3 Undying Lords add-on set. 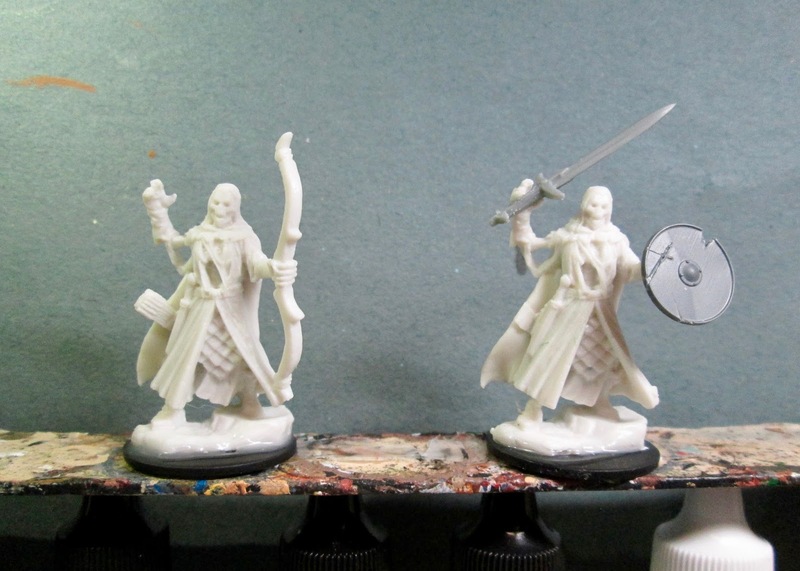 I bought two sets of the Undying Lords so I could include more than just one example of other races in my undead forces. I also planned to convert one of each race of figure so the pair didn’t look like identical twins. I prepped the figures in the usual way; soaking them in a dish of water with a couple drops of dish-soap added, then giving them a light scrub with a soft toothbrush, and then rinsing and drying them. I cut away the bow and quiver on one of the figures, and gave him a shield and sword instead. I then glued the figures to black-primed 1" fender washer with Aleene’s Tacky glue, and then glued the washer-mounted figures to a tongue depressor with a couple drops of the Elmer’s glue. I began by painting the scale mail skirts, and all the skeleton parts with Black. I then drybrushed the skirts with Accent “Golden Oxide”. 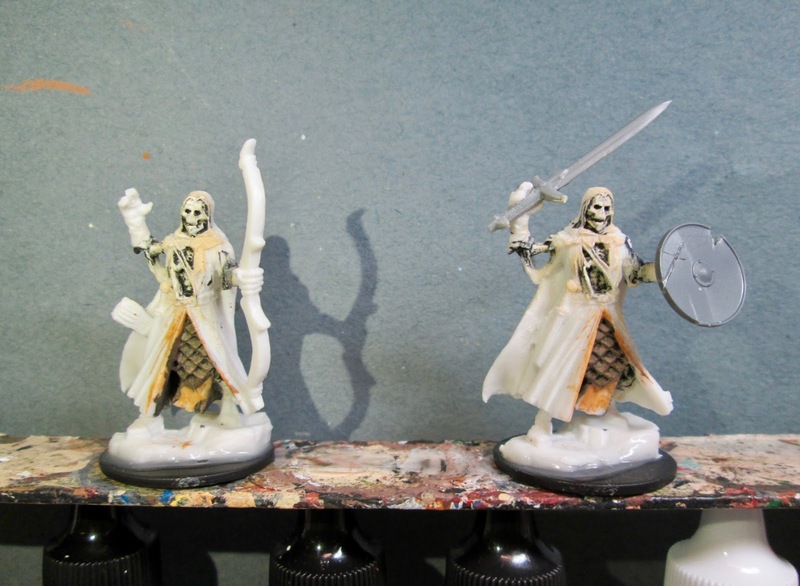 After that I drybrushed the exposed skeleton bits with first Americana “Antique White”, and then Crafter’s Acrylic “Light Antique White”. Next, I painted the little aprons hanging down under their mail skirts, with Americana “Terra Cotta”, and then painted their robes with Americana “Avocado”. 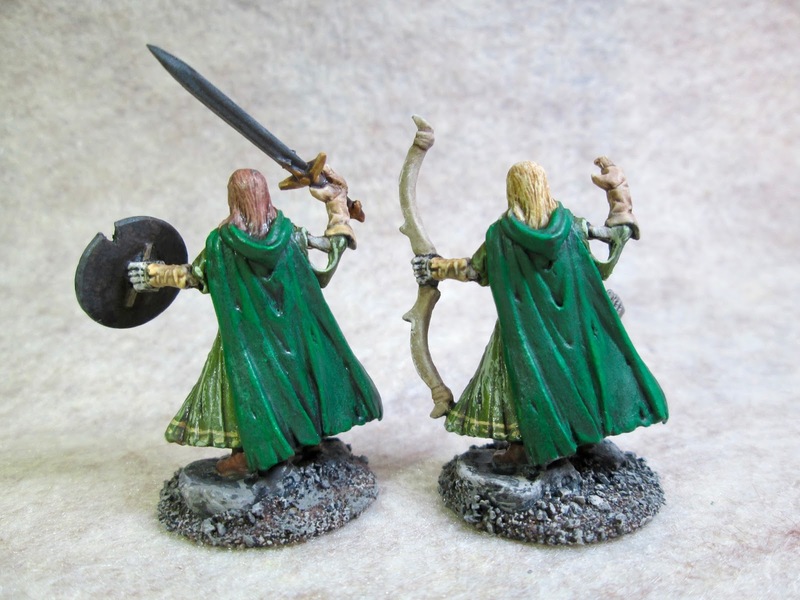 I then painted their capes with Americana “Forest Green”, and their collars with Accent “Mustard Seed”. 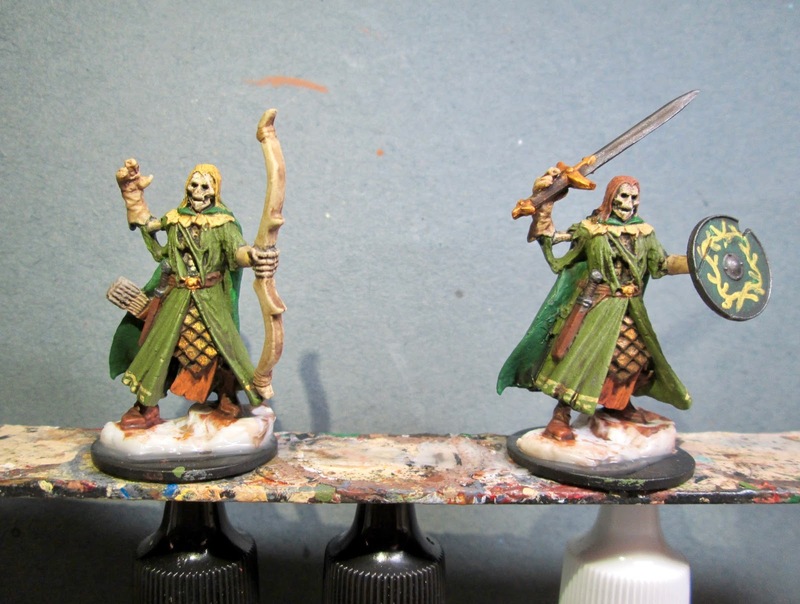 I also used the “Mustard Seed” to paint a design around the hem of their robes. I then painted the hair of the lefthand one with the “Mustard Seed”, and the hair of the righthand one with Folk Art “Teddy Bear Brown”. After that, I painted their boots and all their belts, scabbards, and the quiver with Nicole’s “Brown”; and followed with painting their gauntlets and wrist guards with Apple Barrel “Apple Maple Syrup”. Next, I painted the bow with Folk Art Porcelain White", and the grips on the swords, as well as the back of the shield, with Americana “Bittersweet Chocolate”. I painted the face of the shield with Folk Art “Hunter Green”, and then did a design on it with Americana “Margarita”. I painted the arrow shafts and the string on the bow ends, with Folk Art “Butter Pecan”, and the fletchings, as well as the blade of the sword, with Crafter’s Acrylic “Storm Cloud Grey”. I painted the metalwork on the hilt with the “Mustard Seed”. I then went back and painted the sword blade, and the hub and rim of the shield with Accent “Princely Pewter”. After that, I painted the metal on the hilt with the “Bronze”. Then when everything was dry, I gave both figures a complete wash with Citadel “Agrax Earthshade” wash using a wet brush. When the wash was dry, I highlighted their bones with the “Light Antique White”. 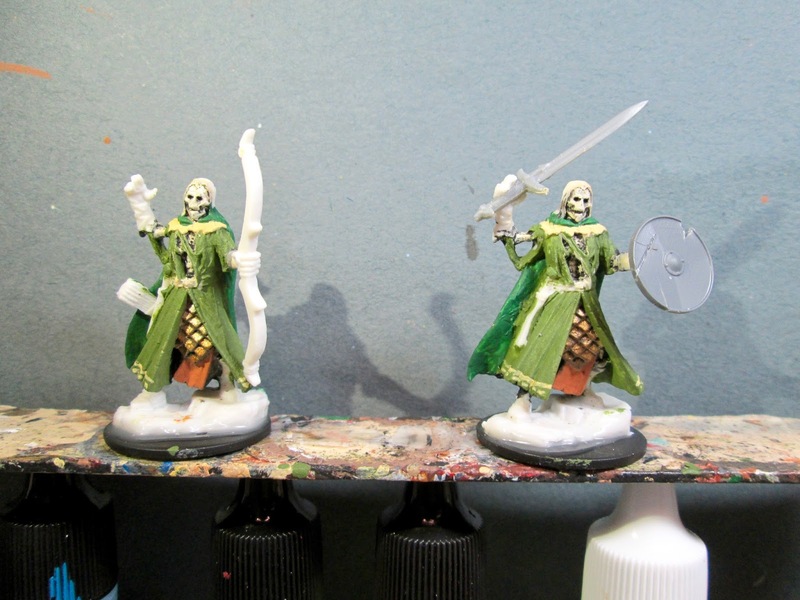 I then highlighted their robes with Americana “Jade Green”, and their capes with Crafter’s Acrylic “Holiday Green”. I then highlighted their belts, quiver, scabbards and shoes, with Ceramcoat “Territorial Beige”, and then highlighted the apron hanging under their armored skirt with Reaper MSP “Pumpkin Orange" Next, I highlighted the hair on the righthand one with Americana "Sable Brown”, and the lefthand one with Americana “Moon Yellow”. I finished up by drybrushing the bow with some Americana “Bleached Sand”, and lastly painted their bases Black. When the Black on the bases was dry, I used some white glue to glue a little sand to the bases. When this was dry, I painted the sand with the Black and then drybrushed the bases with some of the “Neutral Grey”, and then some Americana “Dove Grey”. I let the figure dry overnight and the next day I gave them a coat of Americana “DuraClear Matte” varnish. Another overnight dry, and I sprayed them with Testor’s Dullcote". I’m really happy with how these Undead Elves turned out. I’m looking forward to getting a chance to throw them into a Frostgrave game.